Sodium bicarbonate (NaHCO3) is an essential acid buffer of our body. It forms the largest alkaline buffer in our blood and ensures that our blood remains slightly alkaline (= basic) (pH 7.365) by neutralizing acid waste. Sodium bicarbonate is also known as purification salt or baking soda because of the purifying effect in the removal of acids. Sodium bicarbonate is a body’s own substance. Sodium bicarbonate must be sufficiently present in the body to balance the acid balance of the body. Apart from the body, sodium bicarbonate is used as an acidity regulator in foods, stabilizers, raising agents (hence the nickname baking soda) and in the medical world as an ingredient of medicines against, for example, gastric acid. Due to its use as an ingredient, sodium bicarbonate has also been assigned an E number: E500. Various scientific studies show that as we age, the amount of sodium bicarbonate in our blood decreases significantly. 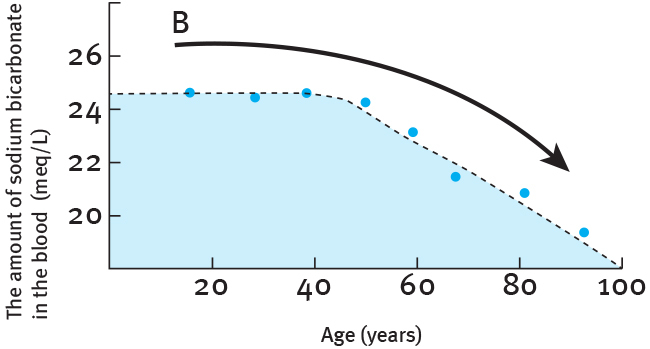 In the graph below, from the research of Dr. Lynda Frassetto*, you see that a substantial decrease in bicarbonate buffers starts at the average age of 40 years. Moreover, within the age of 40 and above a lot of accumulated acid waste is generated. At the age of 90 years, the decrease of bicarbonates in our blood is 18%. Alkaline minerals are removed from the bones, teeth, nails, skin, hair and suchlike to bind with excess acids. This activity creates “acid salts” that can be stored in various parts of the body. Acidification also results in the structural reduction of important mineral resources. In this case, the body converts excess uric acid into uric acid crystals. By retaining moisture in places of the body where liquid acids manifest, the concentration of these acids decreases. A lower concentration means that the acidity is reduced in those places to restore the balance. Among the elderly you often see that much moisture is retained in the lower legs and feet. De-acidify by maintaining the alkaline buffers! By ensuring a daily supply and supplement of sodium bicarbonate, the body will get rid of accumulated acid residues and thus will de-acidify. The more de-acidified (cleaner!) the body is, the better the body can function. Warning! Many websites and other sources recommend to dissolve sodium bicarbonate powder/baking soda in water and to drink it. This is not recommended. The dissolved sodium bicarbonate will then react with the gastric acid and is converted into carbon dioxide, (kitchen) salt and water. This causes a bloated feeling, gas formation, diarrhea and may increase blood pressure due to the increased salt formation. It is best to add sodium bicarbonate to the body without a reaction with the gastric acid. Ensures that the body itself creates extra sodium bicarbonate by drinking alkaline water. Tablets with sodium bicarbonate, potassium bicarbonate and zinc, enveloped by a special gastro-resistant coating. Tablets with calcium carbonate and zinc, enveloped by a special gastro-resistant coating, which are converted into calcium, zinc and bicarbonate in reaction with the present carbon dioxide in the intestines. Tablets with magnesium carbonate and zinc, enveloped by a special gastro-resistant coating, which are converted to magnesium, zinc and bicarbonate in reaction with the present carbon dioxide in the intestines.